The US and southern Canada are lit up at night using power like never before to extend their days. All the major cities and thousands of smaller ones create a fascinating grid of light tied together by highways. Like a galaxy, the illusion of less distance between light sources increases with distance. From the point-of-view of a NASA satellite, the USA at night traces the pattern of electric lights from coast to coast: brighter in the cities, darker in the deserts and tundra. This is the power grid, keeping us all illuminated, protected and connected. Here it’s easy to see: where the people are power follows. Whenever Hollywood wants to show its audience the end of the world, it shuts off the lights in vast regions over the USA. This, as every movie-goer knows, signals the fall of civilization as we know it. Such a scenario has already happened in small patches across the USA and elsewhere, so its not too farfetched. Due to its lack of electrical lighting infrastructure, North Korea is also dark every night (Fig. 2). North Korea has no lights. Surrounding countries light up their outlines and major highways, but in North Korea, they’re not wasting any electricity. South Korea looks like an island here. Let’s remember, it was only about three hundred years ago that the North American continent was dark every night, lit up only by feeble campfires, lightning and occasional moonlight. Look how far we’ve come in this relatively recent ‘Golden Age’ of power generation! You might think the power grid just produced gobs of power and people used what they wanted whenever they wanted to, like flipping on a light switch. But the power grid is a little more complex than that. Power generators, whether they are hydrodynamic dams, nuclear plants, coal burning plants or solar cell farms, have to match their power generation to their transmission capability (which is usually a constant) AND the demand on the other end (which usually varies). So when people go to bed at night and turn off their lights and TV sets, the demand lessens and power generation must be reduced in lockstep. Conversely, the worst-case scenario is in the heat of summer, when air conditioners are running at full blast in every home and office. At such times the power grid reaches its structural limits. Power outages were more common in the past. Today we have safeguards and procedures in place based on the lessons learned from those mishaps. At all times the entire power system relies on time synchronization to match, switch and otherwise follow power demand patterns with just enough – but not too much – power generation. Synchronization problems can lead to catastrophic failures. The massive August 2003 blackout in the eastern regions of the United States and Canada, for example, was at least partially caused by synchronization failures.That’s why today every power plant is synchronized to one precise time delivered by orbiting GPS satellites. In this way, when one portion of the grid needs more power it can get precisely the right amount at precisely the right time. The timing requirements of the power industry vary, largely because the entire system has evolved over many years. The older parts were designed using technologies that predated GPS satellites and the precise synchronization they offer. Since electrical energy must be used as it is generated, generation must be constantly balanced with load. Moreover, the alternating current produced by every generator must be kept in approximate phase with every other generator. That’s quite a task. Generation control requires time synchronization of about 10 milliseconds. Such precision is required by event and fault recorders that supply information used to correct problems in the grid and improve operation. Stability control prevents generator shutdown, loss of load and separation of the power grid. To avoid these problems requires synchronization to about 46 microseconds (±1° phase angle at 60 Hz). Networked controls have requirements one order of magnitude lower, or to 4.6 microseconds (±0.1° phase angle at 60 Hz). Traveling wave fault locators find faults in the power grid by timing waveforms that travel down power lines at velocities near the speed of light. 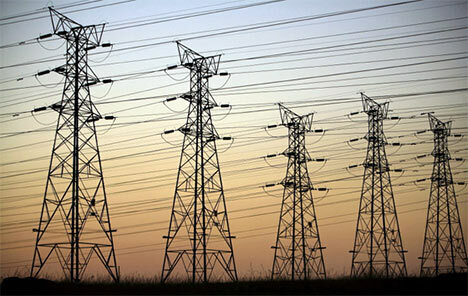 Because the high voltage towers are spaced about 300 meters apart, the timing requirement is 1 microsecond (μs) or the period of a 300 meter wavelength. Newer measurement techniques, such as synchronized phasor measurements, require time synchronization to Coordinated Universal Time (UTC) to within 1 μs, which corresponds to a phase angle accuracy of 0.022 ° for a 60 Hz system. A local time reference must be applied to each phasor measurement unit, and GPS is currently the only system that can meet these requirements. Worldwide and domestically, several power producers listed here and here have purchased Masterclock products for their facilities. Taking references from GPS antennas, these units set a precise time for all the other structures and machines in the station, ensuring synchronization to the most precise tolerances. For home use, the 60 Hz frequency is used as the resonator for low-priced electric clocks and timers that lack quartz oscillators. The legally allowable tolerance for the 60 Hz frequency is only ±0.02 Hz, or 0.033 %, but under normal operating conditions the actual tolerance is much tighter. As noted in an earlier post, such personal bedside clocks are not on Masterclocks’ product list. We’re working at a higher level of precision. Data for this article is derived from a freely available pdf file, Legal and Technical Measurement, Requirements for Time and Frequency by Michael A. Lombardi of the National Institute of Standards and Technology. This entry was posted in analog clock, digital clock, irig, master clock, masterclock, network clock, NTP clock, smpte, synchronized clock, time code clock, time code generator and tagged ethernet clock, industrial clock, irig, masterclock, network clock, NTP clock, time code clock, time code generator by MasterClocktimes. Bookmark the permalink.